It’s not every day that we at ITS are able to stop and take stock of how far we’ve grown since our inception, however seeing as we’re 35 this year, we thought this would be as good a time as any. Also by way of celebrating we’ve managed to put together 35 great deals that’ll benefit you the customer; one for every year that we’ve existed. For us, it all started back in 1979 (those good at maths I’m sure had already figured that out) when ‘Industrial Tool Supplies (London) Ltd’ was founded by John Wild as a supplier of industrial machinery to local trades. In 1981 we took the first step into retail when we opened up a high street shop in Leyton, East London. At that time, we had no internal systems, and very little in terms of held stock or full time staff. In fact there were only 4 staff members including sales, accounts, marketing and directors. After only 2 years we had outgrown that 150sq ft lock up and therefore moved 10 doors down the road to a store that was a far more suitable size. Between 1984 and 1995 our reputation in the local area grew exponentially as more and more local tradesmen began to depend on ITS. As our reputation grew so did the shop itself, as we gradually acquired more of the adjoining premises allowing the shop and offices to expand. This finally gave us room to hold enough stock to keep up with the growing demand. In 1987 we became one of the first in the industry to realise the benefits of computerisation, and since then we have consistently strived to make sure the technology that keeps us going is as up to date as possible. This has allowed us to ensure that the customer has a better shopping experience with us, and our staff work in the most efficient way they can. We will continually strive to make sure we are amongst the best in the business. By the year 2000 we had expanded further and added several vital members of staff to our ever increasing team (many of whom are still playing vital roles in the day to day running of ITS) It was around the turn of the millennium that we developed the ability to fulfil orders throughout the whole of the UK and this encouraged us to develop the mail order side of the company. What were previously periodic flyers with price promotions on soon became far more in-depth and regular mail shots which in turn led to the birth of the ITS catalogue. As the catalogue became more integral to the company, so did the internet. It was in 2000 that we realised that the future of shopping was ‘online’ so we developed our first website which has continued to develop into what it is today. The site will carry on developing to bring to best possible shopping experience to the customer. 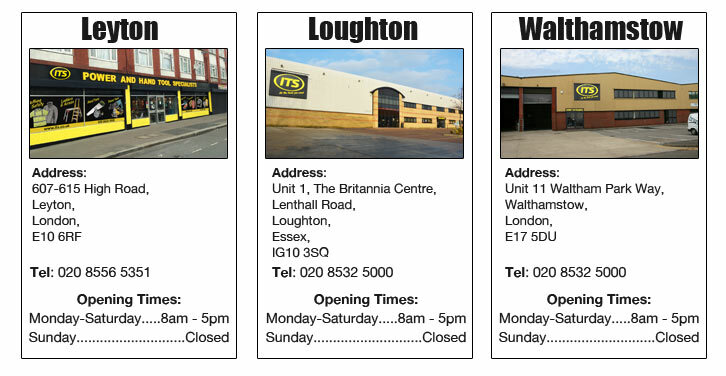 By 2006 we had added more and more units onto our shop in Leyton but it was becoming obvious that we had outgrown those premises and so we acquired a far bigger distribution centre in Walthamstow, North East London. In 6 short years we had again grown at such a rate that we needed to re-locate in order to fulfil stock requirements so we again up-rooted, this time moving to Loughton, Essex where we were able to acquire a new distribution centre bigger than Leyton and Walthamstow combined. Once there we added further stock, increased our range and invested in more staff. In the last couple of years since moving to Essex, we haven’t rested on our laurels for a second – we moved quickly to open the second ITS trade counter and our Loughton distribution centre proved to be the perfect location. Proving massively popular, our Loughton trade counter has become increasingly valued and busy, so much so that we decided to replicate this model with the Walthamstow distribution centre where we have recently opened ITS store number 3! As you’ll see from the images, we have put a great deal of effort and attention to detail in the design and layout of the stores. Our industry has previously had a habit of making trade counters look like warehouses, where tradesman are expected to wonder around a mass warehouse and seek out their items. But we believe that tradesman, our most valued customers deserve the luxuries of visiting a smart, well organised and attractive shop where you can get hands on with our power tools, hand tools and power tool accessories. Feedback to this design has been overwhelmingly positive and we hope to use this uniform to help guide the design of all our perspective trade counters in the future. Helping our brand and meaning that customers know what they’re getting wherever they visit us. Today, our presence on social media, makes it easy for anyone around the world to directly contact us via our facebook, twitter or google+ pages. We have even set up a YouTube channel called ITS TV where we are creating promotional and instructional videos about the products that we’re selling, allowing you the customer to see them in action before purchasing. To subscribe to ITS TV click here. The future of ITS and the power tool industry. So that is what we’ve managed to squeeze into the last 35 years, and now stepping back we can look back on what we’ve achieved with a sense of pride. We have come a long way since a little high street shop in 1981, but we’re constantly looking forward to seeing how we can improve and help you the customer make the simplest and most informed purchase you can, because without you, we are nothing. So the biggest thank you goes to you, the customer because more than anyone else you have made us the company we are today and it is you who is guiding us into whatever we will be in 35 years’ time. « Power Tools Battle of the Brands, they think it’s all over… it is now!